Well … since we, unlike Vice President Biden, are all bound by the laws of the states in which we live as well as the laws of physics, let’s do a breakdown of his assertions. The first problem with this is that Biden apparently forgets that many Americans do not live in a multi-acre, 2.9 million dollar mansion with balconies such as the one he shares with his wife. Nor do most of us enjoy round-the-clock Secret Service protection on-site (in a cottage that he actually forces them to pay rent for to the tune of $12,000 a month if you can believe it). In any case, if your average American were to follow ‘Average Joe’ Biden’s advice, they would almost certainly be committing multiple crimes. Simply walking onto your back porch (which is what most of us have in lieu of balconies) and firing both barrels of a double barrel shotgun in a random direction would probably criminally endanger the neighbors of most Americans who dwell in cities or urban areas. But don’t blame Joe for his lack of knowledge of the law. After all, he did finish 76th out of 85 in his law school and only barely managed to graduate after being caught plagiarizing 5 out of 15 pages of his law review article. So give him a break on that score. He may have been out with a hangover the day that reckless endangerment was covered in Criminal Law class. However, to further the debate, let’s just pretend that we all have multi-million dollar mansions on a palatial estate like ol’ ‘Average Joe’ there. If all we have is a double barrel shotgun and there are home invaders attempting to enter your house, why in the world would you recommend that your wife empty both barrels into the air and put herself in a situation where she is lower on ammo and needs to reload before the gun is useful again? How about the next comment? As we analyze this comment, we are going to continue the scenario we started earlier. Remember that we are just ‘average’ Americans like Joe with our multi-million dollar estate and our double barrel shotgun which our wife has just fired twice into the air as the bad guys try to break down the door. At that point, if she had an AR15 with a standard 30 round magazine, she would still have 28 rounds available to actually confront the bad men should they gain entrance to the home and would not be facing a reload situation that, even if successful, will only give her two more rounds. And how hard is it to reload a double barrel shotgun while panicking? It is extremely hard! Unless you are a practiced shotgunner, it is hard to reload a double barrel shotgun quickly in a non-stressful situation when you do have fine motor skills available to you. In a home invasion scenario such as the one painted by Biden, adrenaline would be coursing through your wife’s body, robbing her of all but her gross motor skills; making the task of reloading a double barrel shotgun a daunting one indeed. The good news? It only takes gross motor skills to insert a new magazine in an AR15. And you would only have to do so if you had already had to fire 30 times. And that brings us to his final comment. Well of course not … that’s why we only arm law enforcement officers with 2 shot firearms. Wait … what? You mean we don’t? Well that can’t be right can it? This just in. The most popular handgun for police officers in the US is the Glock 22 which features a 15 round magazine and officers carry at least one backup magazine as well. Hmm … that’s 30 rounds minimum. Strange. But at least they don’t carry AR15s right? Oh wait … they do? They call them ‘patrol rifles’? Now I am just confused. Joe told me no one needed an AR15. Wait … I know. Maybe the police just don’t use all that ammo. Let me Google a little. Holy smoke! In a 2011 study of NYPD officers, it was determined that, on average, officers discharged 11.5 rounds in a gunfight with a bad guy. Even more startling is the fact that only 30% of those rounds, fired by presumably proficient officers, actually struck the bad guy. And even fewer were fatal or sufficient to stop the threat. It looks like even 30 rounds might not be enough to stop a determined attack by a group of armed criminal. Vice President Biden might want to consider not offering any further advice on self defense until he gets that stupid of his fixed. UPDATE: Steve Griffiths does a great job of covering the manual of arms differences between the AR15 and a double barrel shotgun in his column at Ordnance Corner. This entry was posted in 'Assault Weapons', Gun Control, High Capacity Magazines, Humor, Presidential Politics, Vice President Biden, Vice Presidents. Bookmark the permalink. Add to it the fact that if you step out onto a mythical balcony you don’t have ang use your two shots into the air, in many locales you will be guilty of endangering the public, reckless use of a firearm and assorted other crimes. In some cities, the crime you’d be committing is, in fact, a felony. Of course the police in those same cities can unload their weapons into the chests of innocent citizens, killing them, and stay on the job and keep full pensions when they retire. Joe Biden: a modern day Dan Quayle. I doubt if Dan Quayle is as ignorant as this man. I am beginning to believe anyone planning on running for public office needs to pass some kind of intelligence test. This is just plan logic. Let Shotgun Joe be heard! Give him additional air time! Little better for our cause than an anti shooting himself in the foot. It’s a beautiful thing to see! 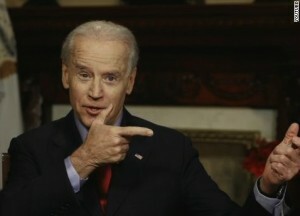 Preferably the ones where Elmer Fudd appears, because even Elmer has something to teach Biden about guns. The nerve! I think you owe someone a big apology for this article. Comparing Peter Griffin to shotgun Joe is an affront to all of the upstanding residents of Quohog! Giggity. I would love to see Joe or even his wife Jill fire a double barrel shotgun, I think though they would have to pick themselves up off of their asses before they even tried to reload. Maybe he can watch the Bugs Bunny episode where he ties Elmer’s double barreled shotgun in a knot. That may spark a new gun control policy from him. We’re all going to be forced to tie our guns in knots! to defend myself. Furthermore, I would venture to guess many home invasions are committed by multiple assailants, usually more than one or two. I’m not sure an AR 15 with one magazine would suffice. I would prefer to be the survivor in such a scenario. My weapon of choice, since we are talking shotguns, would be the AA12 that our military is currently using. Google that and be sure to check out the cute little robot that it can be mounted on and the ordinance it can fire. If it’s good enough for our military it’s good enough for me. Not to mention, if you go out onto the balcony and shoot all your rounds you would be left standing with an empty gun, in the open with no where to hide of go. Unless you jump off of course. Or maybe you keep extra shotgun ammo stored out on the balcony. We really need a better way of exposing these mindless candidates who run for office. I am serious! We cannot just allow idiots like this to get voted into office. There needs to be a psychological and medical exam to include drug testing and sanity testing. I DO agree with the comment made here earlier. We better hope nothing happens to Obama, because Biden IS a loose cannon. If someone comes in to my home with intentions unknown . I’m not going to try to scare them off and hope foe the best. I’m going to defend my family and they can deal with the consequences of their action’s. Not to mention what if some foreign country invades our home land. Our average Joe may also be unaware of the cost of a ” double barrel” shotgun being well out of reach to the average American. He is most likly unaware of the cost of such due to the fact that I suspect he received these guns as gifts from lobbiests and people looking to buy his influence ( money wasted). Few people can afford a gold inlay, engraved, presentation grade baretta. Very likely if Bidet actually as one or more shotguns, he acquired them to waive around to convince dumb ‘ol gun owners that he is a true freedom-loving American rather than a life-long gun-ban crusader. Actually, you can get decent side by side or stack barrel shotguns imported from Italy, central or easter europe or Turkey. A load of birdshot fired straight up is not reckless conduct as the pellets pretty much fall like the gentle rain from heaven. Most bird hunters get showered with them and can verify this. It is illegal to fire off guns in most cities unless you are actively persuing self defense. A Peter Griffin reference: You are now my new Idol. that was perfect! Our VP has now moved from silly to negligent. In most areas of our country warning shots are an unlawful discharge and can be accompanied by stiff penalties. It goes to show you that these folks will stop at nothing to achieve their goals. If this conversation is being waged under deceit and manipulation, we would all be well served to hit the breaks hard becasue something doesn’t pass the sniff test. I wonder if Biden will come to his rescue?